This modern first class hotel is complete with classic Roman architecture. All rooms were completely renovated to the highest standard of style and quality. All rooms have direct dial telephones, color TV and hairdryer. Typical Roman restaurants and antique shops are within the hotel*s vicinity. All of the guest rooms are comfortable and nicely equipped to give a feeling of being home while away from home. The hotel also has a variety of facilities and services that are sure to meet the needs of both business and leisure travelers. *The Hotel also offers Special weekend rates valid Friday, Saturday and Sunday, with a minumum stay of 2 nights. 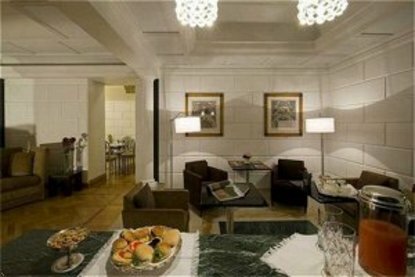 * Very centrally located 300 MT from Colosseum and Roman Forum. 1200 MT from Spanish steps, 50 metres from subway stop Cavour *line B*.